A $450.00 Value, Just $67 with this Limited Time Offer! Some health practitioners find it hard to believe that one well written letter sent to their patient list can double or even triple their appointments for the month, but it sure can! I know because I’ve done it again and again for health care practitioners across the country with the letters I’ve written for them. “I sent out the letter you wrote for my practice and was amazed at the results… I had the BEST MONTH I’ve ever had in my practice in 29 years! Thank you, Robert!”– Dr. Lennox, D.C. The ‘trick’ to getting great results is writing a letter with a compelling offer! It’s not uncommon for professional copywriters to get paid thousands of dollars for just one well crafted letter. And up until now, the only way you could have my help with writing such a letter for you to use in your practice was to hire me as a consultant for $5000 or more! Now I know that not everybody can afford to hire a professional copywriter just to write them a few letters to send out to their patients. This is why I’ve created a new, easy, and very affordable solution for you! In just a few moments you could have one of my professionally written letters that you can literally copy and paste into an e- mail and send to your existing and past patients in only minutes! The letter uses specific words and language that embodies a “tried-and-true” marketing strategy and I want you to use it in your practice today so you can make your phones ring! So what I’ve done is make it so ridiculously affordable you’d have no valid excuse not to grab this letter, download it, and send it to your patients today. Effective marketing letters usually cost hundreds or even thousand of dollars, but I want you to sample my work and see for yourself the results a single letter can produce for your practice, which is why I’m offering this letter to you for just $67! And, I've made it easy for you by including easy instructions for you that will take you step-by-step through the process of preparing and sending this letter. This is an unbelievable deal, especially given that you will recoup the $67 investment with just a single office visit! A letter like this can produce 50 or more additional office visits (depending on the size of your patient base), and give you a return that is many times your investment. Plus, I'm going to also send you an additional marketing letter to promote your detoxification program to your patients. This is my gift to you when you order now. This detox letter is a $97 value if purchased separately. This letter won't be available for long at this low price, so I suggest you go ahead and grab your copy now! I'm looking forward to hearing how well my letter works in your practice! Bonus: Included with your purchase is a professionally pre-written letter you can use (or modify) to promote your detoxification programs to your new or existing patients! This letter is valued at $500 but it's yours FREE with your purchase today. P.S. 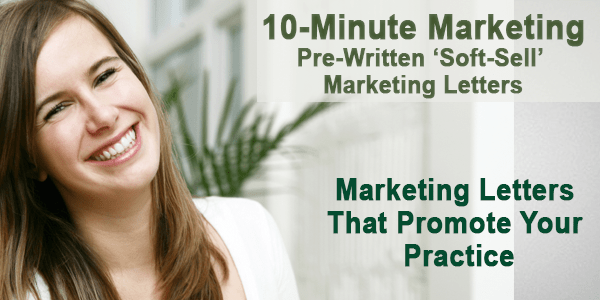 This done for you professionally pre-written marketing letter will get you more patient visits, it will help with your monthly cash-flow, and as an added bonus, it will also help with patient compliance!